When it comes to style and fashion, the European continent is the worldwide leader in innovative styles and trends. Paris, Milan, London and Barcelona are among the leading fashion capitals of the world. Men’s and women’s apparel featured at the runway shows and on the streets of these renowned cities soon become popular throughout the globe. The continent is also the global leader for precision crafted wristwatches for men and women. Many of the world’s most prestigious timepieces are created in Switzerland, France, Italy and the Netherlands. Premium European timepieces are showcased this week at luxury online retailer The Watchery with their European Classics Event. Pace setting Italian wristwatches from Gucci, Panerai, Bvlgari, Fendi MOMO Designs, Welder and U-Boat along with French timepieces from Bell & Ross and Cartier and Dutch-made watches from TW Steel are also included. 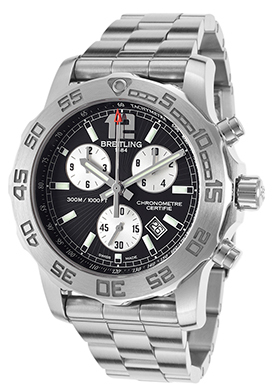 The Breitling Colt II Chronograph is one of the outstanding selections featured in the event. This exemplary crafted Swiss-made chronometer watch holds the distinction of being awarded Chronometer certification by the COSC (Official Swiss Chronometer Testing Institute). The distinctively shaped case crafted in premium-grade stainless steel is presented on a handsome triple link bracelet in stainless steel. The uniquely angled steel bezel with embossed markers surround the black chronograph dial with three silver-tone subdials, luminous hands and hour markers. Features include an automatic date calendar, 1/10th of a second, small-second and 12-hour subdials. Locking screw-down crown and caseback provide water resistance to 300 meters. Swiss-made quartz movement inside assures you of the utmost time-keeping accuracy. Chronograph is 44mm in diameter and 14mm thick. TW Steel timepieces are one of the rising stars in the watch industry. These bold, dynamic oversized wristwatches have been around for less than a decade and are sold throughout the world today in over 100 countries and 5000 retail outlets. 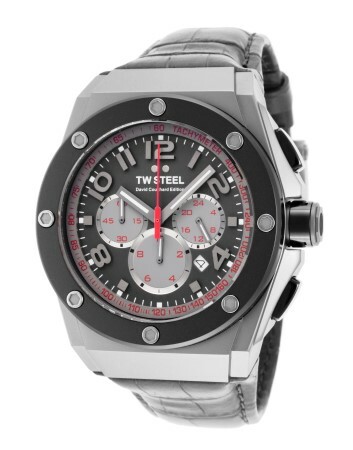 TW Steel Watches started out in 2005 in the Netherlands by a father-and-son team Ton Cobelens and Jordy Cobelens. Ton was a distributor during the 1980s for Raymond Weil and Maurice Lacroix watches in the Netherlands and also produced private label wristwatches for KLM and Martinair airlines. Years later, Ton headed an advertising and promotions agency which created campaigns for the Swatch Watch Group. In 2005, Ton joined with his son Jordy to introduce TW Steel Watches… premium oversized timepieces featuring premium grade stainless steel craftsmanship along with quality Swiss and Japanese movements. The brand, which stands “The Watch In Steel,” originally had four models when it debuted in 2005 to worldwide acclaim and popularity. Today, TW Steel Watches offers over 140 different watch styles for both men and women. Popular European race car drivers David Coulthard, Mitchell Niemeyer and Dario Franchitti along with entertainer Kelly Rowland are among the TW Steel’s global watch ambassadors. Many of these TW Steel ambassadors also have special limited-edition timepieces named in their honor. TW Steel watches are highlighted this week at luxury retailer The Watchery. Popular models from the Canteen, Grandeur Tech and CEO Tech collections are featured at special savings up to 81% off the manufacturer’s suggested retail price. The David Coulthard CEO Tech Chronograph watch, celebrating the 20th Anniversary of Coulhard’s Formula One debut is one of the timepieces showcased in the week-long event. This outstanding men’s watch has a strapping Tonneau shaped case that is 44mm in diameter and 15mm thick. The case is presented on a striking gray alligator-textured leather strap. The black ion-plated stainless steel bezel surrounds the black chronograph dial with luminous hands and hour markers. Features include an automatic date calendar, small-second, 30-minute and 24-hour subdials. Chronograph features quality quartz movement inside and is water-resistant to 100 meters or 330 feet. In celebration of all things American this 4th of July holiday, there is no better time to recognize prominent American fashion designers, whose fashions have created an impact on domestic as well as the international fashion stage. American designers Ralph Lauren, Donna Karan, Tom Ford, Marc Jacobs and Michael Kors easily come to mind. Interestingly Lauren, Karen and Kors achieved their first major successes with their own eponymous domestic lines, while Ford and Jacobs attained popularity designing for Gucci and Louis Vuitton respectively. Today, nothing says American high fashion more than Michael Kors. His fashion apparel collections for men and women, handbags, accessories, fragrances, sunglasses and wristwatches are among the most popular not only in the United States, but throughout the world. The designer’s wristwatches are highly regarded for their bold oversized dimensions, innovative use of materials, not to mention lustrous and highly polished characteristics. Luxury watch retailer The Watchery is currently featuring the designer in their Michael Kors Time watch promotion. Over 80 top-selling Michael Kors wristwatches for men and women are featured in the week-long event, including oversized timepieces, sparkling crystal inlaid dress watches, fashion models and pace-setting chronographs. 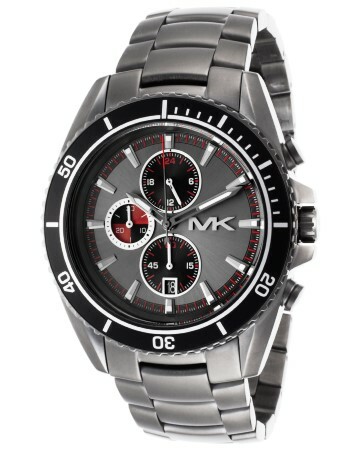 The Michael Kors Lansing men’s chronograph is an outstanding choice for today’s modern man. This impressive timepiece features an amply proportioned case and matching triple link bracelet in gunmetal ion-plated stainless steel, that is highly polished a lustrous patina. A black ion-plated steel bezel with screened white markers and a coin edged rim surrounds the black chronograph dial with three subdials, luminous hands and markers and the MK emblem at the 3 o’clock hour. Features include an automatic date calendar, small-seconds, 30-minute and 24-hour registers. Precise quartz movement inside assures you of time-keeping accuracy. Chronograph is 46mm in diameter, 12mm thick. Summer dressing for both men and women is all about comfort and color. With thermostats hitting the 80s and 90s in most parts of the nation this month, cool lightweight fabrics such as linen and cotton are in vogue. Sandals and canvas shoes are a popular choice and bright colors are featured in many fashion designers’ spring and summer ready-to-wear collections. Color blocked and floral print tops are popular for both men and women this summer. Orange and orchid are the hot colors for women this season, while blue in shades of cobalt to royal and navy are the top hues for men. The perennial summer shades of white, ivory and cream are very popular once again this season in monochromatic looks, using different textures: Pair your white linen pants with a matching colored cotton shirt and a matching colored silk blazer. Whether you’re planning to dress monochromatic white this summer or in bold fashion shades, you’ll certainly want a timepiece to coordinate with your outfit. You’ll find a wide variety of popular fashion watches at luxury retailer The Watchery, during their Summer Designer Event. Over 300 popular brand-name watches from Invicta, Swiss Legend, Michael Kors, Gucci, Charriol, Ebel, U-Boat Diesel, Emporio Armani, Lucien Piccard, Renato, Fossil, Elini Barokas, Kenneth Jay Lane, Chopard, Jorg Gray and Movado are featured in the designer event. 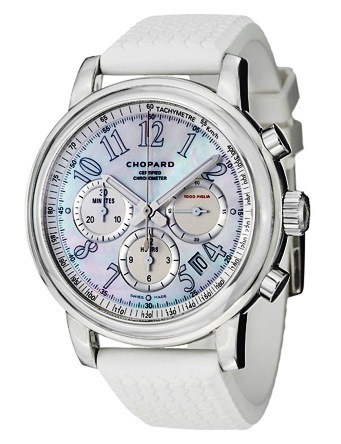 The Chopard Mille Miglia men’s chronograph in white is the ideal timepiece for a monochromatic dressing or any cool summer wardrobe choic. This Swiss-made automatic timepiece features a polished stainless steel case and striking white rubber strap with embossed tire-tread detail. The polished steel bezel encircles the Mother-of-Pearl dial with a tachymeter outer dial, three subdials, luminous hands and Arabic numeral hour markers. A window between the 4 and 5 o’clock hours reveals the automatic date calendar. Chronograph is 42mm in diameter, 12mm thick and water-resistant to 50 meters. Complimentary delivery is included on all domestic watch purchases at The Watchery.